Noise-BanTM Detect is a custom-made hearing protection device containing an embedded metal ball that can be detected by metal scanners. Adjustable filters adapt to the noise in the environment while still allowing the wearer to communicate easily . Noise-BanTM Detect forms part of our Hearing Conservation Management Programme, allowing us to manage and control the effectiveness of the product, in each user’s ear. Detectable by metal scanners. Controlled product effectiveness. Ideal for the food industry. Durable, light-weight, robust, easy to clean and allows easy modification for a proper and comfortable fit. Individual impressions are taken of each user’s ear. Custom-made earpieces are more comfortable and receives greater user acceptability resulting in users wearing it more regularly and for longer periods of time. Makes the product detectable to metal scanners for example on product lines or companies not wanting clients to find a custom-made protection device in their food. A leak-tight test is done during the fitment of the Noise-Ban Detect to guarantee effective protection against noise. A leak-tight fit also ensures that the best hearing protection is provided, resulting in ease of mind. Adjustable in different noise environments, allowing better communication by eliminating over and under protection. No sense of isolation and directional hearing is not impaired. A test canal, in addition to a filter canal, allows us to accurately test the seal and set the attenuation to the correct level. More accurate than a single canal design. Locally and internationally tested an approved. Manufactured in accordance with ISO 9001:2015. EN 352/2 in process – available end of 2016. More cost effective than disposable hearing protection. Filters do not need to be replaced but can be adjusted when a user moves to a different noise environment. Fits more comfortable and allows for communication without having to remove the earpiece. Effective protection against noise ensure that the user doesn’t become tired or distracted by noise. Custom-made to fit properly and comfortably. Username embedded on the product – individualization increases a sense of ownership and greater care. History file is compiled of each use, and stored in a database to manage the effectiveness of the product and the program over time. Records allow us to give feedback to management regarding the program and processes. Marked with your own name. Increases sense of ownership and greater care. Custom-made specifically to fit your ears. Allows for better speech understanding in noise. Depending on the environment, the valve may adjust to ensure you get the correct level of protection to suit the noise level – not too much and not too little. You will receive individualized training on how to use and maintain your Noise-Ban Detect. You will also receive training on noise-induced hearing loss and how to protect your hearing effectively. Protection against the effects of noise-induced hearing loss. 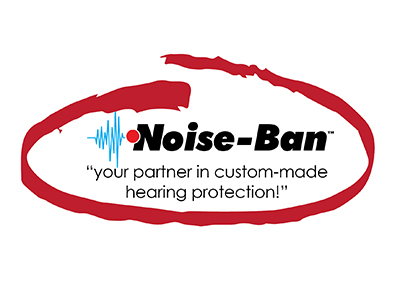 Noise-Ban Elite custom-made hearing protection devices can last a very long time if you take proper care of the product and have it monitored annually for an effective fit. Please notify your supervisor, immediately, if you experience any problems with your Noise-Ban Detect and for annual monitoring.